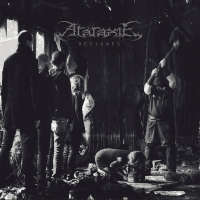 6 years after they released 3rd album "L'Être et la Nausée", French doom/death master Ataraxie unleash their 4th album "Résignés" into decaying world of doom! Extremely heavy doomed riffs sinking into abyss, intense death metal part with tremolo riffs and 2-beat/blast drumming, and strong harmoney by 3 guitars. Majestic low frequency echoing in darkness and sorrowful melodies. This is extreme doom/death that meant to be!